I did pretty good at being more conscientious of what I have been eating and drinking. I still have not went a day without pop, but I have drank more and more water each day. It is easier for me to drink the water while sitting at my desk and working than it has been other places. The exercise has been a little difficult to get in, but I have exercised more this past week than I have in a long time. I have been on my feet more and I feel quite a bit more energy these days! It would be a huge step for me to go one day without any soda consumption whatsoever. If I can go one day, then maybe I can move it up to more soda pop free days. People say that it was a big step in their weight loss progression, but I am having a really hard time giving it up this time around. Please link up so we can build a support system! Research has shown that people that have a support system lose and keep off more weight than those that do not support. 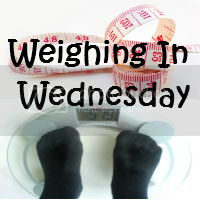 Link up your post about weight loss goals, dreams, successes, tips, or anything else weight loss related. The linky will open Wednesday morning by 8am EST and will remain open for 72 hours.